Ginger is my adorable four-legged friend and his love and compassion for his fellow beings cannot be put in words. I still recall a particular incident when Ginger saved a little pup from stray dogs. It so happened that Ginger and I were taking our routine walk one day when we heard the stray dogs growling. Ginger suddenly got very alert which was unlike him because normally he would simply ignore the other dogs and keep walking. He pulled me towards them and when I restrained, he pulled harder. His leash slipped from my hand and frantically he ran towards the street dogs. This gave me little choice and I also ran behind him. It was then I realised that Ginger was trying to protect a small pup from the stray dogs. Even though he was surrounded by eight of them, he stood there in the middle like a rock and his eyes showed no fear. He growled with a pitch I had never heard before, which scared the strays who ran away from the place. We placed the pup in a safe place and resumed our walk. Since then, I feel I am a proud pet parent to a brave and loving canine. 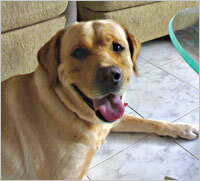 his Lab characteristics; he is affectionate and hates to stay alone. When I come back from school, he greets me with total exuberance. He jumps up and if I am not careful – I can be floored!! His eyes are very expressive and if we don’t give him the desired biscuit, he simply sulks. lizard, and when he cannot reach it, he reacts comically. His antics always leave us in splits of laughter. He is a great companion and we all love Ginger.